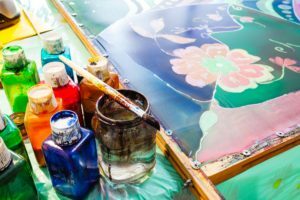 There are many silk painting techniques: gutta, batik, shibori, watercolour, engraving, monotype, screen printing, etc. Each technique has its own particularities and allows us to obtain different results on the silk. There are also many different types of silk: pongee, gauze, crepe, georgette, velvet, satin, etc. The final result will be different on each fabric. 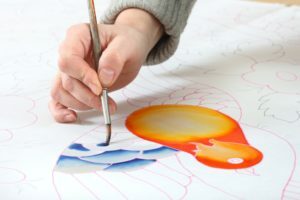 Today, we are going to talk about the classic technique of silk painting, because this is the technique we should begin with, when we start to paint on silk for the first time. This way, we will learn to control the brush load, the humidity and the brush stroke, and to apply backgrounds and degrade colour. We are going to use pongee 5 silk which is of an intermediate thickness and which allows the gutta to penetrate easily. We will also need a soft wood frame of the size of our design; 3-point pins or hooks to hold the fabric on the frame; steam setting silk dyes; essence F based gutta or serti; ‘petit gris’ squirrel hair brushes (it is recommendable to have a few different thicknesses: nºs 4, 6, 8 and 12). Gutta is a derivative of latex, which is used to prevent the colour from extending or running. It is applied with a normographic nib (metal point) attached to a plastic tube. Although there is also water based gutta, I prefer essence F based gutta because it is more resistant to humidity, it does not dissolve when we apply the colour and it does not allow it to run. And now, we can begin! The first thing we need to do is tense the fabric well by fixing it with the pins to the frame. It is important that the silk is tensed evenly throughout. We then wet the fabric with a foam brush to remove the stiffness and we let it dry completely. After this, we apply the gutta by pressing the applicator against the fabric while we draw, as if we were holding a pencil. We can place a template under the fabric and follow the design. We then apply the colour, which we will have diluted with a bit of distilled water. We take two brushes, for example nºs 4 and 8. With the first one, we apply the colour, and we then use the second one dipped in water to obtain shadows and colour degradation effects. Finally, we paint the background. To do this, we take brush nº 12 and we apply our chosen colour from the outside to the centre. We have to do this without stopping, so that we don’t get unwanted lines or breaks in the colour. 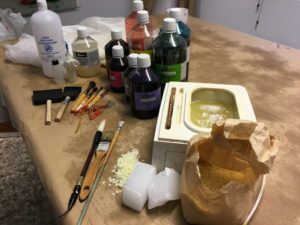 Once the silk has been steam-fixed, we can then use it to create a scarf, a painting, a shirt, etc. 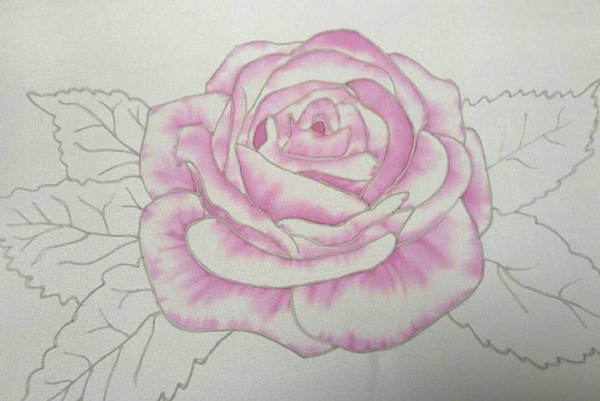 Thank you for your interest in this magical world of silk painting.